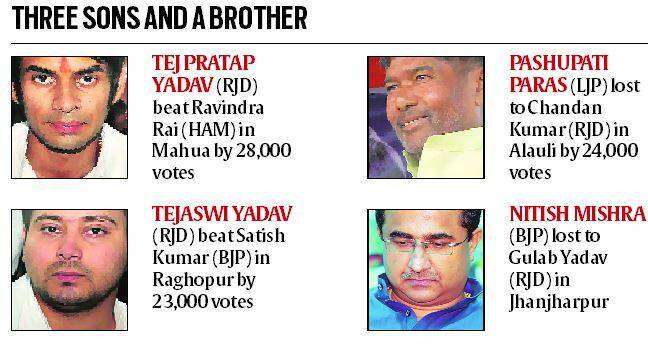 Tejaswi Prasad Yadav and Tej Pratap both secured big wins. Tejaswi defeated BJP’s Satish Kumar by 22,733 votes in Raghopur, a seat that had been held by both Lalu and his wife Rabri Devi in the past. The 2015 Bihar assembly elections launched both sons of RJD chief Lalu Prasad, with the elder Tej Pratap winning by a higher margin than the younger but more visible Tejaswi. Other members of prominent political families, especially those in the NDA, fared poorly. Tejaswi Prasad Yadav and Tej Pratap both secured big wins. Tejaswi defeated BJP’s Satish Kumar by 22,733 votes in Raghopur, a seat that had been held by both Lalu and his wife Rabri Devi in the past. Satish had defeated his mother in 2010; this time, he rebelled and joined the BJP when the maha gathbandhan fielded Tejaswi. Tej Pratap trounced HAM’s Ravindra Ray, also a rebel from the JD(U), by 28,155 votes in Mahua. 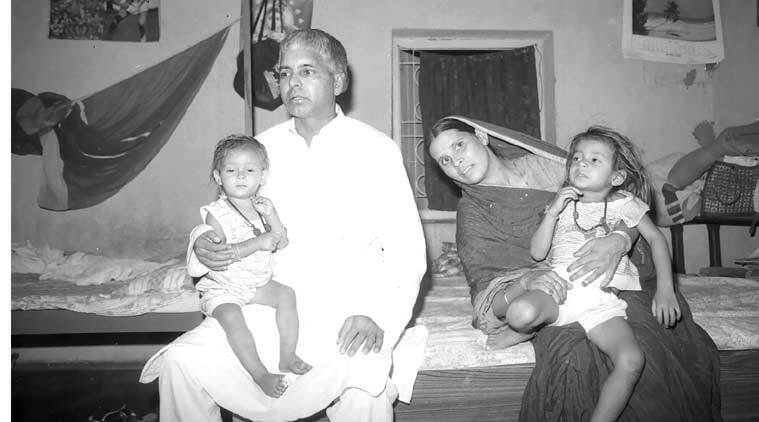 Jitan Ram Manjhi fielded his son Santosh Kumar Suman from Kutumba seat where he lost to Rajesh Kumar of the Congress. Ram Vilas Paswan’s brother Pashupati Kumar Paras was considered a formidable candidate for Alauli but was thumped by Chandan Kumar of the RJD. Paras got 46,049 votes to Kumar’s 70,519. Another member of the family, Paswan’s nephew Prince Raj, lost to JD(U)’s Maheshwar Prasad in Kalyanpur. Nitish Mishra, former CM Jagannath Mishra’s son, lost from Jhanjharpur. A three-term MLA from his father’s seat, Nitish Mishra was a minister in the Nitish Kumar and Jitan Ram Manjhi governments. When JD(U) split, he chose to side with Manjhi and was contesting on a BJP symbol. C P Thakur’s son Vivek Thakur, who was the BJP candidate from Brahampur polled 63,303 votes but lost to RJD’s Shambhu Nath Yadav. In Bhagalpur, Arijit Shashwat, son of Ashwini Choubey, lost.